The Hawaiian sandwich from Smacky's on Broadway. Your hands were there first. Before you could even grip a spoon, you picked up those peas or Cheerios with your tiny fingers and attempted to shovel them into your mouth. People around you cheered when the food didn't end up on the floor. With the following section, we're getting back to basics, featuring items that probably could be eaten with a fork, but for the sake of decency should be eaten with the hands. Everything below tastes amazing. These dishes are some of the area's best, cheap (which doesn't mean low quality) or otherwise. Some of the restaurants are a little more upscale, but if you play your cards right by attending happy hour or only ordering from the appetizer or dessert menu, you can hit that under-$10 mark quite easily. Bread, the kind that comes in a shallow pool of garlic and grease, is almost better than pizza. The first time I ever went to BENNIDITO'S (1426 S. Lincoln), I knew I was in love with a different kind of bread-based food: beer buddies ($4.25), fist-sized dough balls covered in melted butter and sprinkled with gobs of Parmesan cheese. Dipping sauces enhance this puffy pillow of bread; options are marinara, pesto (the one you'll eventually start dreaming about) and ranch. They're supposed to be the appetizer, but paired with a green salad, they can be the best dinner you ever had. Don't hesitate to order up a big basket just for yourself. On to another kind of breaded food item, sandwiches: With possibly the best name of any sandwich shop around, SMACKY'S ON BROADWAY (6415 E. Broadway, Spokane Valley) doesn't disappoint when it comes to making jumbo sandwiches (averaging $6 to $9). 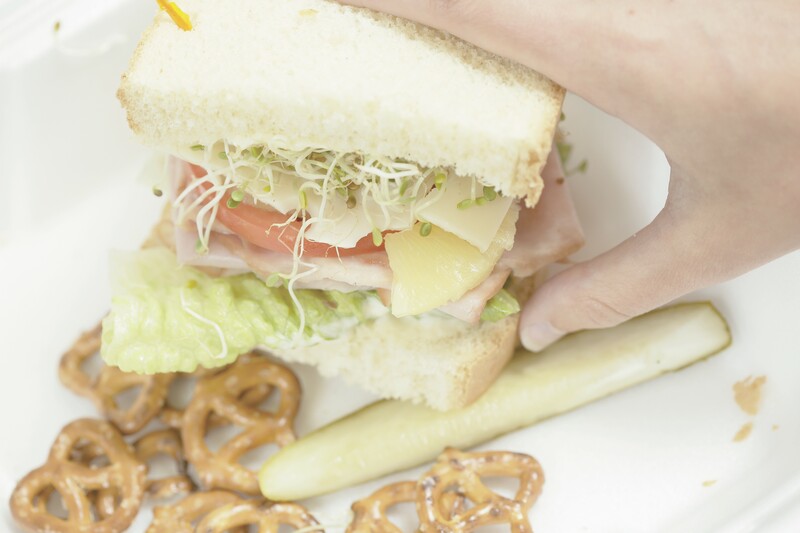 The Hawaiian features layers of thinly sliced ham, pineapple, sprouts and tomato between two slices of white bread. The albacore tuna sandwich, with melted swiss and tomato, is the place you'll want to start if you like fish at all. Best of all, your meal comes with a side of pretzels and a dill pickle, and the eclectic decorations inside the joint will keep you entertained for hours. The 21-and-over joint pulls you in with its reverence to the stars and moon — telescopes are part of its décor. This is also a place that might be playing punk rock on Friday and Saturday nights, with a bevy of handheld food, washed down with a beer or fresh-squeezed cocktail. The seasonal spring rolls ($8) — herbs, pork and seasonal market veggies inside a rice wrapper, with peanut sauce — are incredibly filling and can serve as a full meal. So can the crudités platter (veggies and dip) ($8). There are hot and cold sandwiches as well, and nothing's more than $10. Serving great food for the past 76 years, Roger's is the place to go if you're looking for a satisfying single cheeseburger ($6.81 for a combo) in Coeur d'Alene. It ranks with the area's best burger joints; everything here is made to order. Each morning, lettuce and tomatoes are hand-cut, as are potatoes for the delicious French fries. With two locations to choose from (downtown is a walk-up stand) you'll want this a greasy pile of goodness immediately. Other options include turkey and garden burgers, along with grilled cheese. It isn't easy to find this breakfast/lunch-serving cafeteria; it's located in the bowels of a business park complex. Once there, experience some of the most creative handheld items around. Last week, we tried the grill and deli specials, the Reubano ($6), a mix of the Reuben and the Cuban, and the buffalo chicken sliders, which included pulled chicken, buffalo sauce, blue cheese and chicken-fried jalapeños. Both were astounding. On the permanent menu, choose between fish n' chips ($6.49), a variety of tacos ($2 each) and a multitude of sandwiches. The owners also have the Wandering Table, Yards Bruncheon and Gilded Unicorn to their credit. Don't listen when people tell you popcorn isn't a meal. It absolutely can be, especially if it's as stellar as Blackbird's popcorn, which features bacon fat, salt and brown sugar. For anyone who's crazy for popcorn, it's just about the best in town. Pop in for happy hour, which runs most days (minus Saturday) from 3 to 6 pm and features half-off select draft beers, $5 select wines, $5 select cocktails and $3 select bar snacks (like popcorn). This is a perfect spot for a drink and a bite before a downtown night out. The chorizo corn dogs and twisted pretzel should also be on your radar. Thinking dessert? The coffee and donuts ($7) aren't too sweet and melt in your mouth. This is an Italian restaurant with old-world charm. Show up for lunch with a friend and share an appetizer — you won't have to spend more than $9 each. Selections include hummus, served with fresh vegetables and fresh, oven-baked focaccia bread; caprese salad; onion and cheese-loaded flatbread; and a pesto torte. You can even get a mini pizza for only $6. The in thing for pizzerias is the fast, make-it-right-to-order style. While Porch Light has jumped on that bandwagon, its wood-fired selections are a lot better than the chains' efforts. For $8, you get a specialty pizza the size of a dinner plate, big enough for now and probably later. Go with one of the specials, or create your own toppings — and they have pretty much anything. College kids aren't the only ones enjoying this spot. Not all cultures embrace the tradition of a cold, stainless-steel implement between food and its consumer. For centuries, certain dishes have necessitated a more intimate eating style, one where fingers delve into dishes and sauces permeate the pores. For instance, in both Morocco and Ethiopia, the hands are the main utensils in any meal. In Morocco, age-old custom dictates that meals are eaten only with one's right hand; the left hand can be used only to pass dishes or pick up bread. Some of what is now known as Ethiopian finger-food cuisine, specifically the famous injera bread, originated with the Aksum culture around the fifth or sixth century.